This is the first step to volunteering with our Cultural Mentoring program. 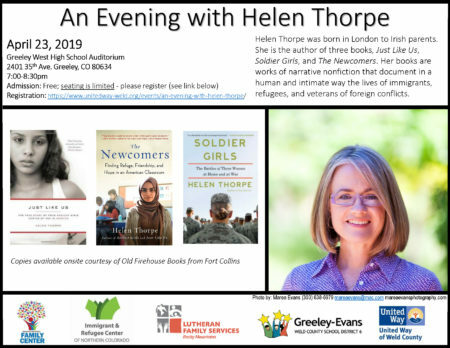 During this session, you will learn about the current refugee situation, our co-sponsorship partnership with Denver Rescue Mission, and how to befriend and serve newly arrived refugee families and individuals. During an interactive training, you will have a chance to ask questions and role-play in kinds of situations you may encounter. Parking: There is parking at our office: 1600 Downing Street, Denver, CO 80218. There is also plenty of free street parking. Your car WILL NOT be towed using our parking lot after 5:30pm or on Saturday morning. ​Food: You are welcome to bring food and a beverage as long as it isn’t a distraction for others or yourself. Children: We encourage you to bring children if you plan to have them involved. We do ask that you are considerate if you bring babies and toddlers as the conference room space used for the training can make it a big distraction for those attending. If you are in need of the wheelchair accessible entrance, please indicate in the line above. Belong Church, our host, is a historic building and while it does have a wheelchair accessible entrance it is not the main door.